Our clothes dryer stopped working last week. We had a repair guy come take a look, and it sputtered to life–but then quit again after a handful of loads. Finally, we gave in and bought a new dryer. When the guys came to install it, the old vent thing fell out of the wall…along with about eight years’ worth of dog hair, beach sand, and lint. I know. I know. Don’t be telling me what a fire hazard that is. Or that we should have checked the vent set-up before replacing the whole thing. Believe me, I know. But that’s not the point of this blog. The point of this blog is that September is Book Giveaway month, and this week’s featured title from author Ty Saltzgiver is And Jesus Said, “…Follow Me”. See? So much good stuff, all offered in bite-sized chapters we can read on our own or with friends. Surprisingly (because this is NOT a subject that I like to dwell on too much), one of the Follow Me chapters I found most captivating was about sin. A sign of drawing closer to Jesus is being more aware of one’s sin (sometimes even having the accompanying “feeling” of being farther from Jesus). It’s like the light being turned up brighter in a room revealing faded paint, a water spot, and a crack in the wall, all that were unnoticed in the previous low light. Boy, do I get that. You are forgiven and God does not count it against you. The sin is disarmed; it no longer has the same power in your life. God can begin, in his power and time, to heal you and take that sin from you. 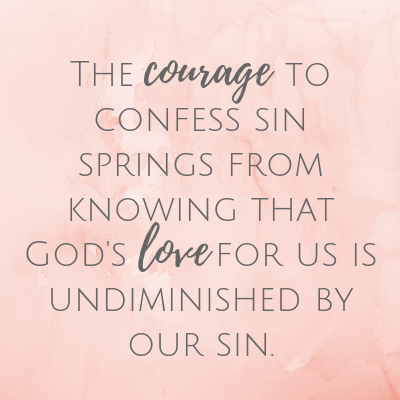 The courage to confess sin springs from knowing that God’s love for us is undiminished by our sin. He longs to pour out His love on us, and in us, in Tidal Wave fashion. He longs to grow us into the unique person who He’s dreamed us to be. He longs to be intimate with us. Our sin unconfessed is the only barrier. And there’s lots more in the chapter–like, thought-provoking discussion questions, catchy Greek words for sin, and Bible verses that can help us flesh out the picture. The only thing missing (and I don’t mean to tell Ty how to write) is the obvious illustration about how our relationship with the Lord is like a clothes dryer vent. As long as it’s clear, our lives work pretty well. But clog up the works with a mix of dog hair and sin, and stuff starts to break down. There is just no flow. But when we identify and dislodge the bad stuff–when we name our sin and humbly confess it, even if that feels painful or awkward (and speaking from experience, it often does)–God goes to work. The stream of living water which flows from the heart of Jesus into our hearts flows less constricted, more freely. We find ourselves caught up in a tidal wave of God’s love. Show me the places where I resist reviewing myself, places where I may be (even unknowingly) hiding my sin. Grant me the courage to confess, secure in your limitless love. 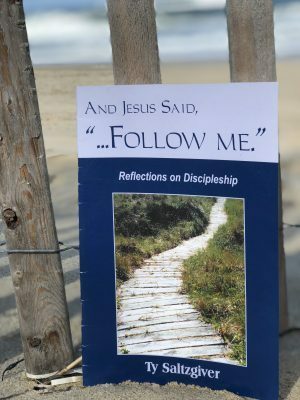 And Jesus said, “…Follow Me” is a great book for small group discussion–even if your “group” is the teenagers around your table at dinnertime. I tested a few chapters (they’re just two pages long) on my (young adult) children this summer, with decent results. I mean, my people actually made a few engaged-sounding comments. Which I count as a win. Want your own copy of Follow Me? Click here to order, or enter to win this week’s giveaway by posting a comment here, or on Instagram (@Jodie_Berndt), or Facebook (@JodieBerndtWrites). And congrats to last week’s winner, Jenny Francis – Jenny, your copy of My First 30 Quiet Times is on it’s way!